We brought you the best of the best eats from New Zealand, so here’s our top tasty treats from Australia. Are you a breakfast person? You’ll love this place. If not, Pancake Manor will turn you into one. Flip right through the lunch menu items and go for the gold: perfect pancakes in epic proportions. With flavors like Black Forest Cherry, Bavarian Apple, and Bananarama, be prepared to be “wowed” with breakfast delicacies that will fulfill your appetite and your sweet tooth. Pancakes aren’t your thing? There’s always “The Ultimate” crepes. Pancake Manor regular Adam Hutchinson said the joint is open 24 hours and a popular spot for late night drunkies. Way classier than Taco Bell, right? Kim and I were sad to leave Pancake Manor behind in Brisbane but to our excitement found Pancake Parlour in Melbourne. More fantastic flavored pancakes topped with heaps of ice cream. Lovely. A dream come true for chocoholics anywhere. After hearing from a Melbourne local that it has “hot chocolate to die for” we made it a priority to find this slice of heaven called Koko Black. Here’s a challenge: try not to drool when you look through the menu. The beloved Belgian hot chocolate (also available in flavors like chilli, chai, and hazelnut) shared the page with “spoil” treats including chocolate cake, shortbread cookies, chocolate mousse, ice cream, and divine individual chocolates. 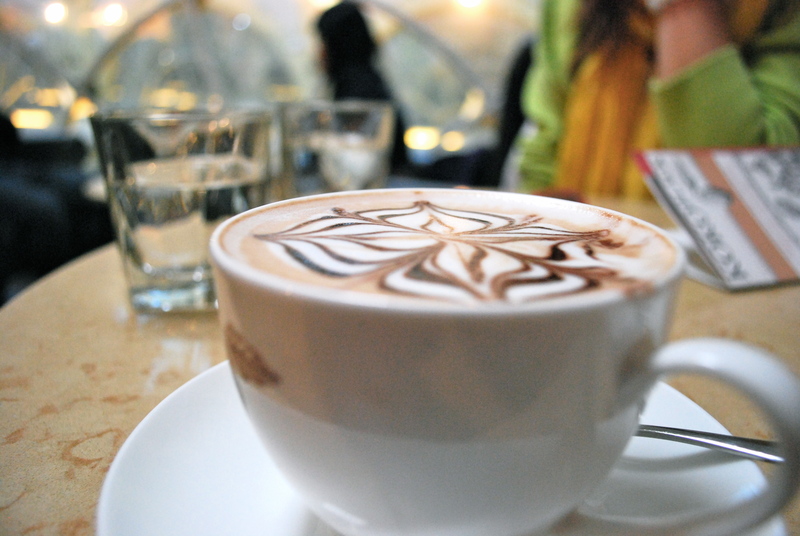 After one sip of the Belgian hot chocolate, it became clear why the chocolate parlor was packed. As if the sweet treats weren’t enough to lure you in, the décor of Koko Black matched the items on the menu perfectly-rich and luxurious. Perfect pick for a romantic evening with a significant other or for a girl’s afternoon. A Melbourne staple that claims to have the “best fries you’ll ever try.” Its niche? Authentic international sauces to top your cone of salty potato treats. From the thirteen flavors available, Kim and I tried Persian, Vietnamese, and Thai . Persian is an aioli garlic mayo sauce, and Thai is a golden satay sauce. Our favorite? The sweet chili mayo referred to as the Vietnamese sauce. A little sweet, a little heat, a lot of goodness. Open to the wee hours of the a.m. for your late night fry fix. This low-key café is nestled sweetly in the middle of Center Place laneway of Melbourne. Serving up lattes, sandwiches, breakfast, and most importantly- homemade ricotta cheese donuts. These bad boys are fried to golden perfection and topped with heaps of powdered sugar. 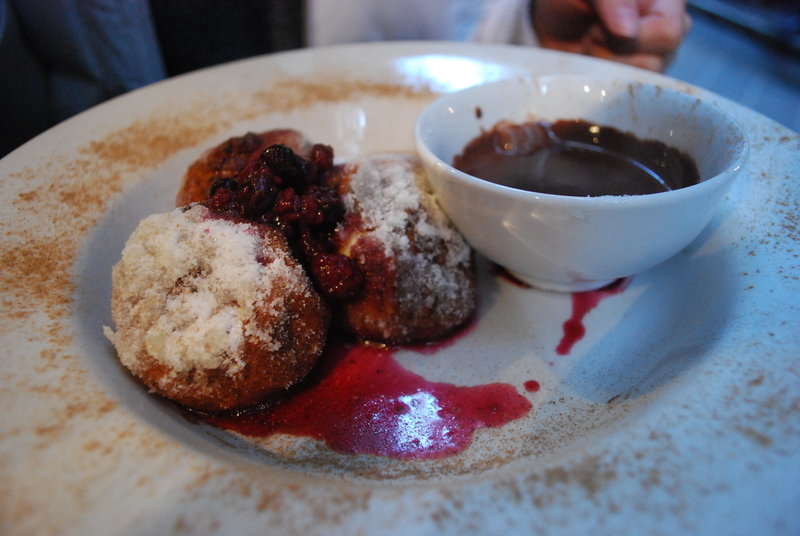 The warm chocolate sauce and strawberry compote compliment the dish fantastically. So good we made Issus our café of choice for breakfast the next morning. While dining at Issus Café one day, we noticed a teeny restaurant tucked away in Center Place with a line out the door and half way down the street. Obviously, when we see a line like that filled with Melbourne locals, we knew we had to check it out. So cleverly named “The Soup Place” this gem offers a huge variety of hearty and healthy soups. They are all made daily free of preservatives, colors, and additives. Kim asked to have the best selling soup and was served a huge bowl of Spicy Moroccan Chicken soup. To compliment the soup, they also offer fresh (and free!) olive bread. 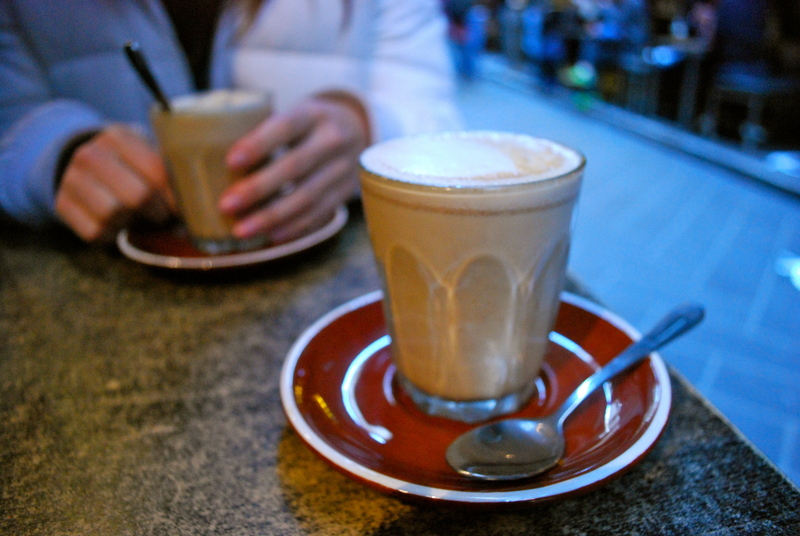 Great choice for a cold winter afternoon in Melbourne. Luckily, “The Soup Nazi” was nowhere to be seen. Did we see a kangaroo in Australia? Only on our plate. Kim and I had the opportunity to try a kangaroo fillet at Manly Grill in Manly, Australia. So, what is kangaroo like? It’s a very gamey meat best served medium rare. The taste is most comparable to a super lean steak. One bonus about switching up a normal steak dinner for kangaroo is the great nutritional value. Kangaroo is high in protein and iron, low in fat content, and big in flavor. Now that we’ve left behind traditional Western style cuisine in New Zealand and Australia, it’s time for Thailand and Laos to bring full on flavors at ridiculously low prices. Yum! Over the past few days, Coley and I have dedicated a good amount of our time to simply exploring Melbourne, Australia. Our favorite discovery of the city is the unique and charming laneways where we passed the hours drinking lattes and people watching in this intimate atmosphere. Melbourne’s laneways are basically narrow enclaves winding in all directions throughout the city which are filled with one-off boutiques, street performers, graffiti art, distinctive galleries, tiny cafes, and hidden bars. The best word to describe the culture of laneways is “artsy.” These laneways are hidden gems in a big bustling city. You can be walking down busy Elizabeth Street and turn into an alley way and BAM it’s like you’re in a whole other world. It’s an interesting experience to be so relaxed, sipping a latte while hundreds of people pass you by only inches away. 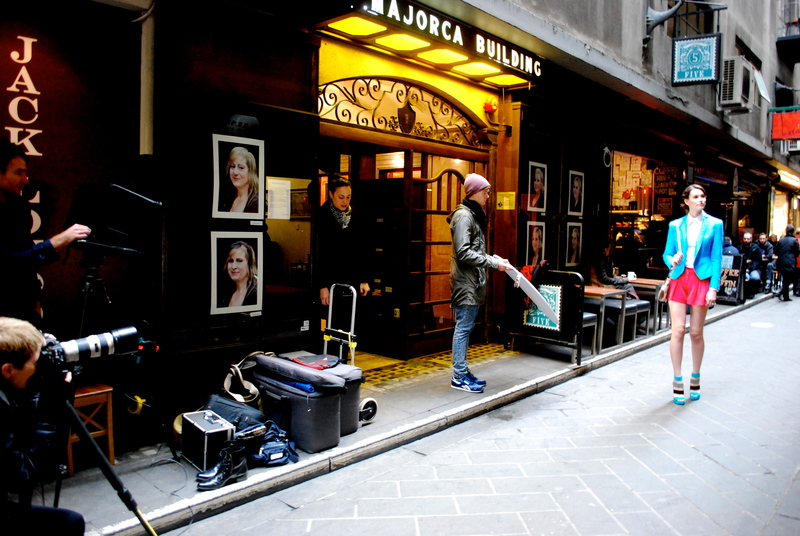 Today while returning to our favorite laneway in Center Place, we stumbled upon a high fashion photo shoot in session. You just never know what you’ll find in the laneways. They come in all shapes and sizes. Some are elegant and enclosed, some trendy and alternative, and others are adorned with the most stunning and creative graffiti art one could imagine. Instead of trying to ban urban graffiti, the Melbourne city council has actually allocated a few specific laneways with a street art permit where artists can just go crazy. This is best showcased on Hosier Lane, our absolute favorite bluestone cobbled laneway, completely covered in stencil work, light boxes, graffiti, and hole-in-the-wall cafes. Even the garbage cans and dumpsters are decked out in graffiti. We spent hours wandering through this alley and admiring the art. 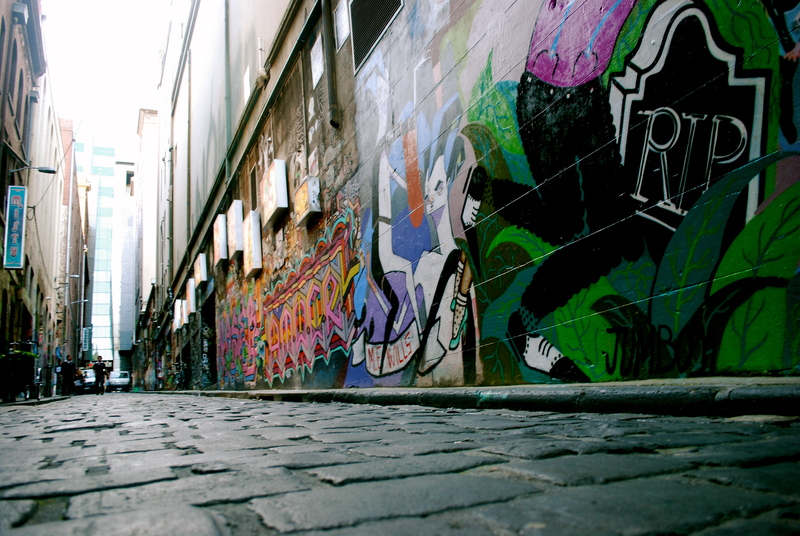 So whether you go for a coffee or to check out the high quality graffiti art, Melbourne’s laneways cannot be missed.